Roma Victrix. The Republic of Rome is on a relentless march to create an empire - an empire built on the backs of the conquered, brought back to Rome as slaves. Attia was once destined to rule as the queen and swordmaiden of Thrace, the greatest warrior kingdom the world had seen since Sparta. Now she is a slave, given to Xanthus, the Champion of Rome, as a sign of his master’s favour. Enslaved as a child, Xanthus is the preeminent gladiator of his generation. Against all odds, Attia and Xanthus form a tentative bond. A bond that will spark a rebellion. 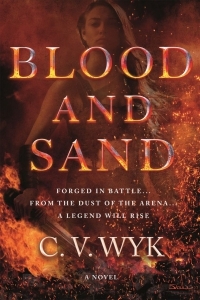 A rebellion that threatens to bring the Roman Republic to its end - and gives rise to the legend of Spartacus... From talented debut author C. V. Wyk comes an action packed, stirring, yet poignant tale of two slaves who dared take on an empire. The legendary Spartacus is recast as a fierce female warrior in this action packed tale of a 17-year-old princess and a handsome gladiator who dared take on the Roman Republic.